While the major league club packed up and headed north last week, the minor leagues are just wrapping up camp today. With that, this will be our last edition of the 2017 Fort Report and we will begin our Monday and Thursday notes columns later this week. Also, don't forget to look out for the first Cup of Coffee on Friday morning! Injuries forced the Red Sox to make some last-minute tweaks to their Opening Day roster. On Thursday, the team placed starting pitcher Drew Pomeranz on the 10-day disabled list with a left flexor strain. While Pomeranz may be able to make his first scheduled start of the season on April 9th, Boston will carry an extra reliever for the first few days of the season. Manager John Farrell announced on Friday that Ben Taylor (pictured) would make the Opening Day roster after a spring training that saw him post a 3.46 ERA with 19 strikeouts and three walks in 13 innings. With Josh Rutledge on the disabled list and first baseman Mitch Moreland dealing with the flu, the Red Sox also had an opening for a utility infielder and backup first baseman. Jen McCaffrey of Masslive.com breaks down why the Red Sox named Steve Selsky to the Opening Day roster over Marco Hernandez. Left-hander Robby Scott also found himself in Boston's bullpen after a spring training where he pitched to a 0.75 ERA across 12 innings. 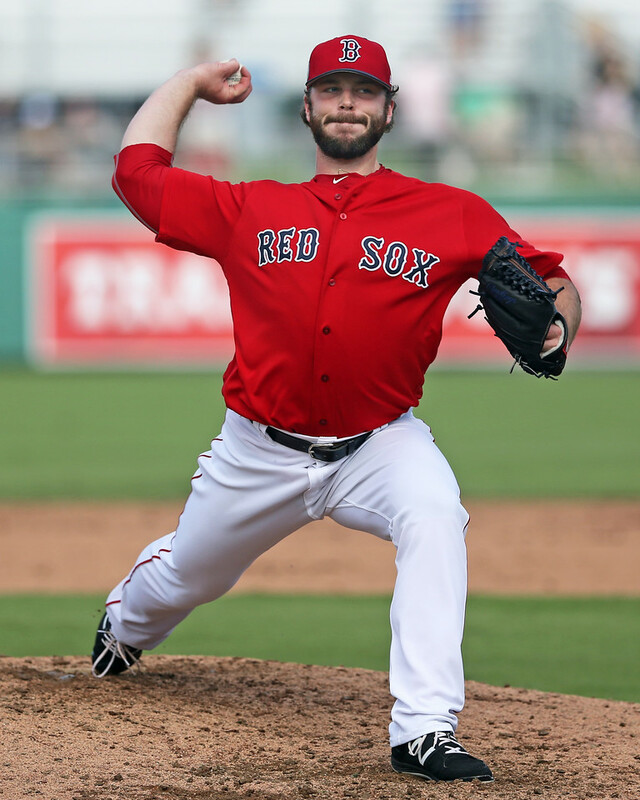 Scott will serve as the third lefty in the Red Sox bullpen alongside Robbie Ross Jr. and Fernando Abad. It is prediction season around the major leagues and top Red Sox prospect Andrew Benintendi is the odds-on favorite to win the American League Rookie of the Year according to the experts at Sports Illustrated. After a season in which he moved from catcher to left field before a season-ending injury in early June, Blake Swihart is excited to return to catching full-time. Swihart will begin the year as the everyday catcher in Pawtucket but he's expected to make an impact in Boston later in the season. Michael Chavis missed more than a month with a torn UCL in his thumb after a hot start to the season. His bat cooled off after he returned from injury but he explains to Christopher Smith of MassLive.com that he was playing through a broken middle finger through the rest of the season. He suffered the injury during infield practice two weeks after returning from his initial injury. The Red Sox designated outfielder Bryce Brentz for assignment last week because he is out of options and was not slated to make the major league roster. He has cleared waivers and the team has outrighted him to Triple-A Pawtucket. The Orioles selected outfielder Aneury Tavarez from the Red Sox in the Rule 5 draft last winter. Despite a solid spring in which he slashed .292/.382/.396 with a home run and eight steals, there was no room for Tavarez in Baltimore and the Orioles returned him to the Red Sox on Sunday. Tavarez hit .330/.374/.495 in 111 games between Portland and Pawtucket last season. The following minor league players (not on the 40-man or a non-roster invitee to major league camp) saw action in major league games this Monday through Wednesday: Jordan Betts, Tzu-Wei Lin, Deiner Lopez, Danny Mars, Tate Matheny, Mike Miller, Joseph Monge, Cole Sturgeon, Kyri Washington, Jantzen Witte.